Have you ever purchased a new product that you thought was awesome?! Something new that you wanted to get in on the ground floor and help market. Well my friend Bob Van Ess goes to Sturgis every year and came across such a product which is being promoted mostly to hunters and other gun enthusiasts. He purchased the Sportsman Eyewear AV glasses at Sturgis and is now distributing them for the American company out of Waynesboro, VA focusing on the motorcycling market. The Sportsman Eyewear are sunglasses with high quality built in video camera and audio capability for taking pictures and video sans hands! That’s right! No more carrying cameras or video cameras; perfect for motorcyclists! The glasses take a smoother picture than the mounted types because they do not suffer from the vibration of the road and motorcycle. How often have you wished you could be taking a picture or video of exactly what you are looking at while riding?! This is the answer to your wish. Perfect if you don’t wear a helmet and fit comfortably with shorty and half helmets. Might not work as well with a full face or three quarter. Sportsman Eyewear continues to be the technology leader with their second generation dual technology video recording sunglasses featuring 720 x 480 Audio/Video Recording plus a 1280 X 1024 Digital Camera. Their processors are custom built to exacting design specifications utilizing the finest US made TDK components and producing the finest audio/video quality with bright bold colors and crisp resolution. 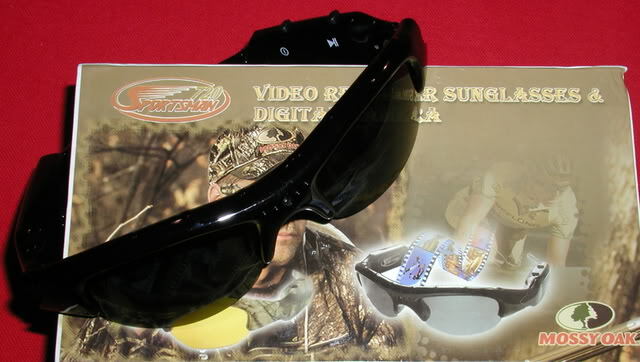 The Sportsman A/V glasses use the industries best Kingston Micro SD Card as recording media. Also included at no additional cost are the 115V Wall Charger Adapter, 12V Vehicle Adapter and a Micro SD Card/USB Thumb Drive Adapter. The lenses are ANSI safety rated while providing UV protection. When you purchase Sportsman Eyewear your warranty is immediately in effect and there are four full service repair facilities in the US. Video/Audio recording eyewear, great for recording motorcycle rides, hunting trips, archers, anglers, traffic police & travelers. Power duration of 3 to 4 hours. Purchase of Video recorder sunglasses & digital camera will includes three separate interchangeable lenses- dark sunglass lenses, Yellow lenses & Clear lenses. Will also include: AC adapter, card reader, USB cable, car charger, cleaning cloth, carrying case, lanyards, user instructions. The glasses plug directly to your computer (PC or Mac) via USB cable and do not require any special drivers or software. Video recording download and playback are easy. WARRANTY – 90 days free parts and labor against factory defects and workmanship. Warranty doesn’t cover damage/breakage to the frame. Warranty doesn’t cover damage/breakage to the frame due to dropping or mishandling. The warranty doesn’t cover electronic damage due to water, over/improper charging, including the Micro SD Card. Extended Warranty must be purchased at the time of sale. Shipping cost for repairs will be borne by both parties. EXTENDED WARRANTY – A one, two or three year Extended Warranty is available at the time of purchase for $29.00 per year. Extended Warranty must be purchased at the time of sale. Shipping cost for repairs will be borne by both parties. Contact Bob at 610-533-2060 for more information. While checking out the quaint town of Oakland, MD just outside Deep Creek Lake I wandered into a fantastic bookstore that had great travel books and small town personal service with a smile. The store is the Book Mark’et & Antique Mezzanine. I was pleased to find this resource of backroads and byways in Maryland. The book is called Backroads & Byways of Maryland and includes all the great destinations in Maryland. The book has alot of interesting information about the history of these places, restaurants and inns. Personally I think it should be called something more like Great Destinations In Maryland because it is more about the destination spots than the Backroads and Byways. In fact I would say it isn’t about byways at all. As far as docovering new scenic roads it is no help but it is still a good resource, especially if you are new to traveling in Maryland. Click here for more information. East Coast Biker Online November 2011… we contributed nothing. Sorry folks. Just too busy last month to submit articles. Cracked Skulls Are No Fun! Head injuries are no fun, but this picture is! 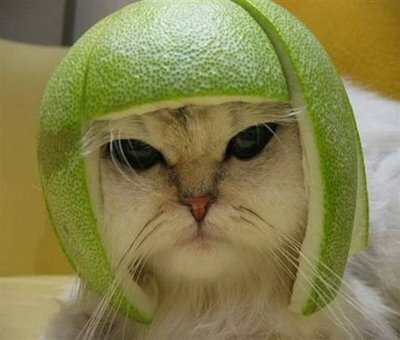 The folks at Motorcycle Helmets Direct have a message for you: “Keep that skull from cracking!” Motorcycle helmets help keep your brain in its place as our feline friend here is demonstrating. If you ever get thrown from your motorcycle you can seriously injure your head and a DOT or SNELL approved helmet will be your best insurance policy against skull damage. If you have an accident without a helmet you stand a good chance of suffering from skull damage, brain damage, or even death damage (the worst kind). Although motorcycle helmets are not required by law in all states and world regions, I recommend you consider wearing one for your own good. Motorcyclists who are aware of the personal risks should consider wearing one to prevent avoidable injuries of a very serious nature… such as skull damage, brain damage or death damage (the worst kind). You may think these helmets look silly, especially the one pictured above, but it will be difficult for you to ever ride a motorcycle again with half your brain missing… although there are quite a few people who succeed. You don’t want to be one of them! The current selection of helmet offerings is vast, so nerdy looking bike helmets aren’t the only options on the market. Many helmets are designed to be sleek, streamlined, and color conscious, so that you don’t stand out like a sore thumb driving down the highway. Unless, of course, you want to stand out like a sore thumb. In that case there are quite a few hi-viz helmets available to choose from. No matter what, I’m sure you can find a helmet that fits your style (and your head). Modern motorcycle helmets come in a wide variety of colors including everything from simple black motorcycle helmets to stylish designer helmets that have funkadelic artwork, unique patterns, and bright colors. Your options certainly aren’t limited. You’ll probably have a hard time picking one due to all the different cool helmets out there. When selecting a bike helmet you’ll want to keep a few things in mind. First, find one that fits your head properly. The helmet should fit securely so that there’s little chance it flies off your head when you need it most. However, that doesn’t mean the helmet should be tight. The right one will fit comfortably and securely on your head. You’ll want to invest in a high quality helmet that will hold your skull together if it should happen to hit the road. A cheap helmet isn’t a helmet you want protecting your skull/brain. For that reason, always shop for one at a reputable motorcycle helmet dealer. Look for one that is DOT or SNELL approved so there’s little risk of purchasing a helmet that doesn’t meet the highest safety standards you can afford. Once your new helmet is comfortably strapped on your invaluable skull you’ll be able to hit the road without the worry that your head won’t be protected should it happen to hit the road.